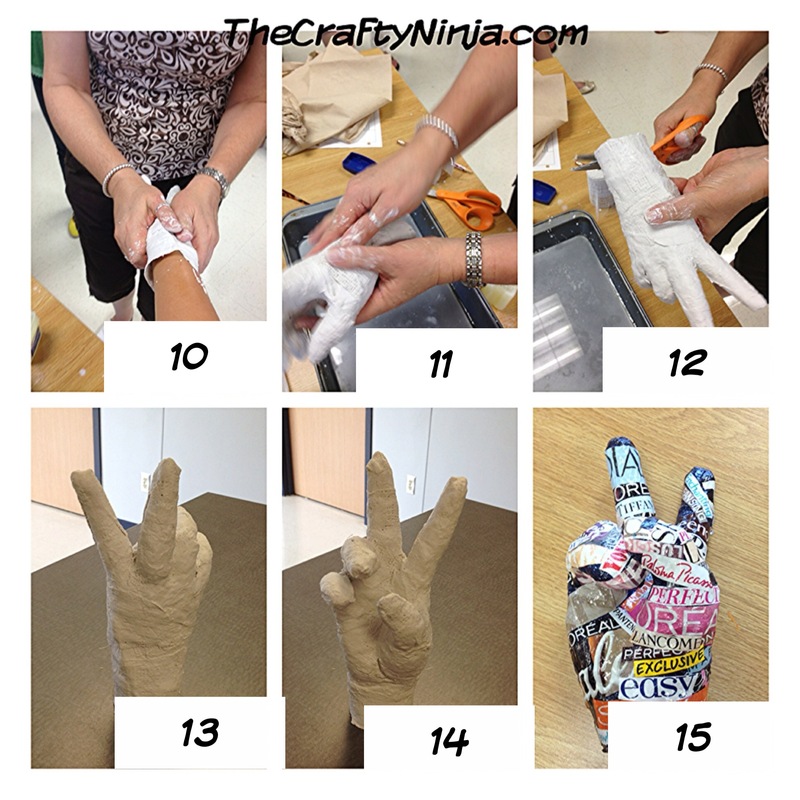 I went to an art conference and learned the process to plaster cast hands. This was a really fun lesson that I would love to teach for a fifth grade art project. The instructor uses the objective of sign language and communication. 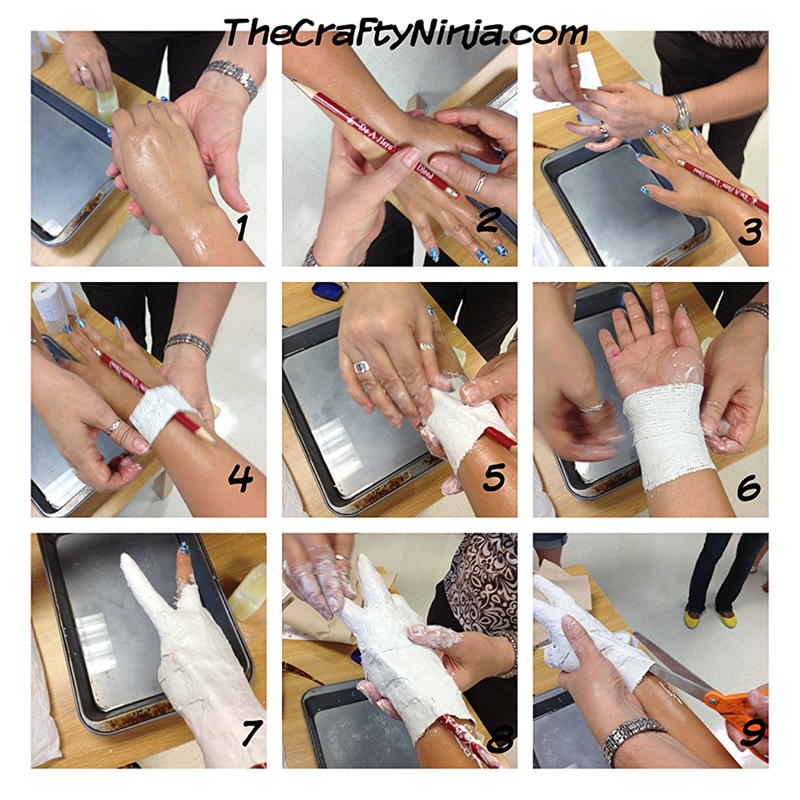 I was fortunate to be the instructors demo model and she casted my hand with the plaster stripes. The students will pair up for this project and one student does their hands while the other one wraps and switch the next day. The supplies needed: Pre-cut 2×4 plaster stripes, Petroleum Jelly, Baking pan filled with water, Pencil, and Scissors. 1. First apply the whole hand and wrist with Petroleum Jelly. 2. Using a pencil place it one the back of the hands, the pencil will make it easier to cut the plaster off later. 3. Dip the plaster strip into the water and remove the access water by squeezing through your fingers. Too much water is not good for this process. 4-6. Keep applying the strips around the wrist. Be sure to rub and overlap the pieces. 7. After the wrist is wrapped have the person pose their fingers. No gang signs, etc… 8. Rub to make sure the fingers are sealed. 8. Remove the pencil and carefully cut up to the knuckles, best if the instructor does this. Continued: 10. Carefully pull the plaster cast off the hands, if the fingers break you can plaster it back on with the plaster stripes. 11. Once the plaster cast is off repair the cut that was make with the scissors, by adding the plaster stripes and rubbing. 12. Using scissors cut the bottom to make it even and the hand will be able to stand. 13-14 Example of the finished project. 15. 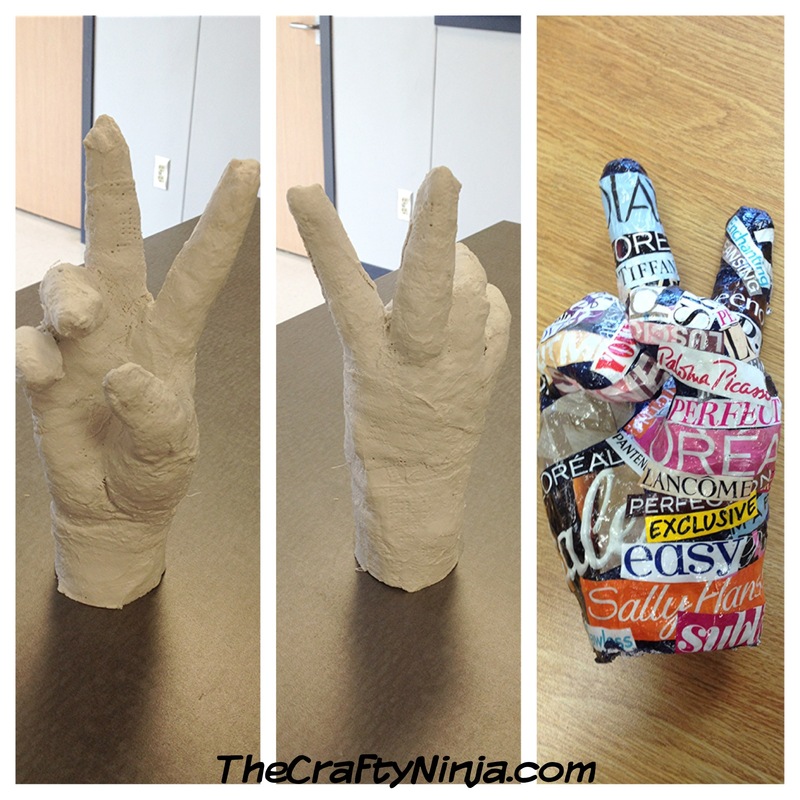 You can take this lesson further by sanding the hand to smooth it out and adding magazine clippings using Mod Podge.